Except for his obsession with the obelisks, Pope Sixtus V was also obsessed with restoring the ancient aqueducts of Rome. He restored the ancient aqueduct Aqua Alexandria that carried the Aqua Virgo, a.k.a the Salone, waters which allowed for the construction of 14 new fountains in Rome. Upon completion of the restoration, the Aqua Alexandria was renamed to Aqua Felice after the Pope’s first name. One of the most interesting fountains built by Sixtus fed by the Felice aqueduct waters were the Four Fountains at the crossing of ‘Via 20 Settembre’ and ‘Via della 4 Fontane’. At this crossing, there are exactly four fountains at each of the corners of the crossing. Two of the fountains are dedicated to rivers (Tiber and Arno) and two of the fountains are dedicated to the Roman female goddesses Diana and Juno. This crossing is exactly 2775 meters away from St. Peter’s Square obelisk in eastern direction. It perfectly aligns with the St. Peter’s Square obelisk and the Equinox Sun sunrise within an accuracy of less than half a degree. More interesting, is the fact that this crossing is famous because three obelisks can be viewed from this place. The first obelisk is the obelisk of Fontana dei Dioscuri. It resides on this piazza next to a fountain. The original fountain no longer exists but contained the Dioscuri, Castor and Pollux statues from Constantine the Great of Rome's Baths. These statues were deliberately moved to this fountain by Pope Sixtus V in 1588. The second, is the obelisk of Piazza di Spagna and can be reached via the ‘Via Della 4 Fontaine’ from the Four Fountains. At the Piazza di Spagna (Spanish Steps) the water basins of the fountains are adorned with sculptures of the Sun! Water is flowing from the mouth of the Sun filling the fountain. The third obelisk is the obelisk at Piazza dell Esquillino residing at the other end of the road ‘Via della 4 Fontane’. The Piazza dell Esquillino was given the obelisk from Augustus Mausoleum by Sixtus V. Sixtus V has been buried in the Sistine Chapel of the Basilica Santa Maria Maggiore at the Piazza dell Esquilliono. The Basilica itself is aligned to the Winter Solstice and the ceiling of the nave of the basilica is adorned with eight-pointed crosses! These three obelisks and their fountains reside on a cross with the Four Fountains at the centre. The fourth leg of this cross ends in Piazza di San Bernardo where another fountain is found. 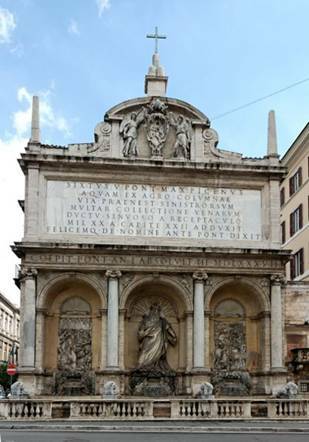 This fountain receives its waters from the Aqua Felice, it’s the terminus of the aqueduct that was restored by Sixtus V. It’s name is ‘Fontanna della Aqua Felice’ but it is better known as the Moses Fountain since the statue of Moses stands in the centre of this fountain. Original Egyptian lions spit the water of the Aqua Felice into the basin of the fountain. On top of this monument the three hills of Sixtus V coat of arms is displayed with the Christian cross on top of that. The street plan of the roads leading to the Four Fountains and the Four Fountains themselves were all designed by Pope Sixtus V who intentionally connected three obelisks and the Moses fountain with four fountains at the centre of a cross. The Four Fountains is also connected with the obelisk at St. Peter’s Square since it resides due East from the Vatican. Most importantly, the road Via delle 4 Fontana that was built by Pope Sixtus V aligns to the Winter Solstice sunrise! This means that the two obelisks at the Piazza di Spagna and the Piazza dell Esquillino also align to the Winter Solstice sun at sunrise! The road ‘Via 20 Settembre’ perpendicular to the road Via delle4 Fontane forming the crossing of the Four Fountains does not however, as one might expect, align to the Summer Solstice. The question is, why would Sixtus V connect and associate obelisks with fountains and water? Why in a cross shape and why four fountains at the centre? And most importantly, why are two of the obelisks aligned to the Winter Solstice sunrise? In addition, the Four Fountains aligns perfectly with the obelisk at St. Peter’s Square and the Vatican’s causeway to the River Tiber. 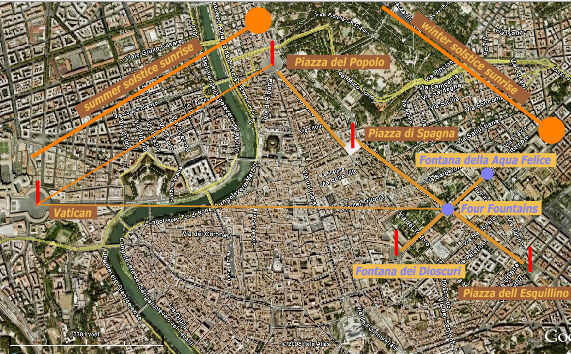 What had Pope Sixtus V been aiming at by this major urban redesign? The answer is that the urban redesign including the restoration of the ancient Roman aqueducts and building of the Four Fountains crossing can be associated with the Milky Way and the four Galactic Alignments that occur in a Great Year when the Sun resides on the Milky Way waters. Associating four fountains with obelisks is therefore esoterically suggesting the four Galactic Alignments when the Sun (obelisk) resides on the Milky Way (fountain). All of the squares where the obelisks reside in Rome were given fountains and the fountain of Piazza del Popolo (designed by Pope Sixtus V.) is even octagonal in shape (the diagonals form an eight-pointed cross). Last but not least, Pope Sixtus V built the fountain of Moses at the end of a cross leg of the Four Fountains and left some very interesting exoteric clues as the significance of Moses and his relation with the Milky Way. Next to Moses in the Fontana della Aqua Felice, Aaron and Joshua are displayed. Aaron, Moses’ brother, and Joshua, Moses’ apprentice, were both figures that played a significant role in the Exodus of the Israelites out of Egypt. On the left, Aaron is leading the Israelites through the receded waters; and on the right, Joshua is showing the army the way to the Red Sea. The point is that Moses has been equated by freemasons with the Sun (read Wicherink’s article reinterpreting Herschel’s interpretation of the Bradford University freemasons information release. The Moses fountain relates to Moses and the Israelites passage of the Red Sea. The esoteric message of Moses crossing the waters is that it relates to Sun’s crossing of the Milky Way! Fountain of Moses, notice the coat of arms of Sixtus V on top. Three hills with the cross of top. Pope Sixtus IV was the first Pope to build a new bridge over the Tiber in Rome since ancient Roman times. He built the Ponte Sisto just south of the Vatican. Obsessed with water, Sixtus V too of course wanted his name attached to a bridge. He decided to build a new bridge outside of Rome near Magliano Sabina, 50 kilometers north of Rome. The name of this bridge is Ponte Felice. Ponte Felice was initially built on dry ground and the riverbed was modified later such that the water would now flow under the bridge. The question is, why didn’t Sixtus V build his bridge in Rome in the first place? After all, he was the great architect of the redesign of the infrastructure of Rome, so why build a bridge outside of Rome? And why did he build the bridge near a small village of little to no importance? Why on dry land since it required the riverbed to be modified? This bridge apparently was not meant to be just another bridge across the Tiber. The answer to these questions is that the bridge had to be aligned to the Summer Solstice sunrise and the dense infrastructure of Rome didn’t allow for such a bridge to be built! 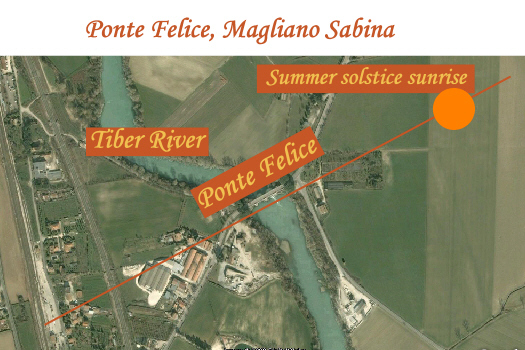 Ponte Felice aligns with the Summer Solstice sunrise. The Pope had literally built a bridge for the Summer Solstice Sun to cross the Tiber River, esoterically encoding the Sun’s crossing of the Milky Way at the Summer Solstice. Pope Sixtus V is surely not the only Pope to associate obelisks with waters. Innocent X designed the Fountain of the Four Rivers around an obelisk at Piazza Navonna in Rome. The fountain was meant to be an allegory to the Four Rivers of the world, the Nile, the Ganges, Danube (Donau) and Rio de la Plata. Needless to say, that the Nile was the ‘River of the Heavens’ (Milky Way) for the Egyptians as was the Ganges to the Hindu’s. Pope Urbanus VIII (Maffeo Barbarini) had three bees and the Sun in his coat of arms. This coat of arms is depicted in Palestrina on a main gate called Porta del Sole (Sun Gate). The gates of the Sun of course are the Silver and Golden Gate. The ‘Barbarini Sun’ can be seen on many buildings in Palestrina. Pope Sixtus V’s urban redesign plans were aimed at restoring the ancient wisdom of the Galactic Alignments and included the design of St. Peter’s Square, the Summer Solstice alignment of the obelisks of St. Peter’s Square and the obelisk at the Piazza del Popolo and the design of the cross of the Four Fountains connecting two obelisks with the Winter Solstice sunrise and associating it with the Milky Way waters. In addition, he built Ponte Felice demonstrating exactly the esoteric concepts of the Solstice Sun and the river waters.